Another page in the Wisconsin I-94 widening story…..my op-ed piece in the Milwaukee Journal-Sentinel here. My previous posting, with map, links to my full report, etc. is here. I’m sure there is a lot more to follow! On Wisconsin…..to a better alternative to freeway widening! Congrats to Bruce Speight, WISPIRG, and the Coalition for More Responsible Transportation for going nose to nose with Wisconsin DOT over the agency’s proposed widening of I-94 in Milwaukee. It’s a bad project, out of touch with the times and the place, and deserves to be replaced by something better. My role has been to offer a real alternative for the something better: “The Rehab/Transit Option: A Better Solution for Milwaukee’s East-West Corridor.” The Coalition formally launched the option at a City Hall press conference today (links to the press release, the full report, and a map of the transit plan all available on WISPIRG’s website here). Milwaukee Journal-Sentinel story, with video, slide show, and link to paper here. The two pieces of the proposal are pretty straightforward. The Rehab part would replace WisDOT’s unnecessary widening with a rehabilitation project. The Draft Environmental Impact Statement actually concedes that most of the infrastructure, safety, and operational issues on the highway can be addressed through a rehab option. The Transit piece proposes a new, high-quality, rapid transit system in the corridor that would provide long-term, sustainable mobility, much more in keeping with the needs of a 21st-century city. At this stage of the game, the transit plan is very much conceptual, with detailed planning and engineering stages needed. 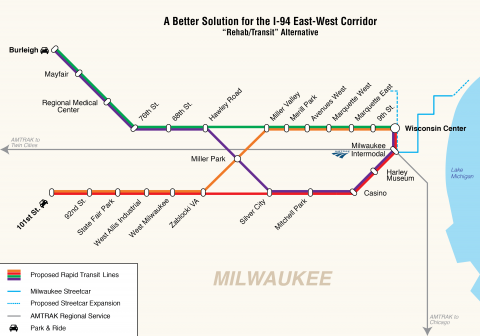 But hopefully the concept plan will show Milwaukee and southeast Wisconsin citizens how major origins and destinations can be better linked by a modern transit system than by an 8-lane (in some places 10-lane) urban freeway! Alas, those of us who struggle to reignite a sense of purpose and optimism in this country, and especially those of us in the transportation field, took another hit recently with the announcement of the end of the Columbia Pike Streetcar project in Arlington, VA (story here). County leaders took stock after the re-election of an anti-streetcar member of the county board (his initial election to the board in a special election was considered a fluke – my story here) and threw in the towel. This was a real setback for smart growth advocates. Arlington is the poster child for transit-oriented development – at least in the Northeast – and Columbia Pike looked to be an ideal setting for a streetcar that would promote transit, leverage sustainable economic development, and enhance the region’s investment in the Metro system (to which the streetcar would link). No doubt the streetcar project had issues, being big and complex, and expensive, and perhaps just too heavy a lift for a small jurisdiction (227,000 people). And when it comes to funding projects like this, the federal government is nowhere to be found, doling out money to only a handful of projects around the country. At this rate, it will take us a century or more to build the projects that we ought to put in the ground in one generation.